Originally from the Congo (Katanga province), writer, scientist, literary scholar, social activist. 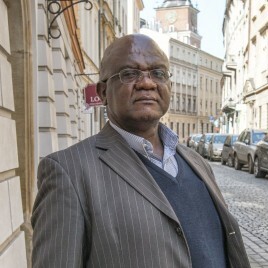 He left the Congo in 2006 after he was released from Makala prison in Kinshasa thanks to the efforts of Amnesty International and academics from around the world. Arrested a year earlier by the Congolese National Security Agency (ANR) and unlawfully imprisoned, he witnessed the torture and disappearances of other detainees. After leading the prison, unable to continue his scientific or creative work, he chose the fate of a writer-refugee. He currently resides in Krakow on a stipend from the ICORN International Cities of Refuge Network, established in 2005, which provides shelter and support to writers and artists who, because of persecution, cannot work in their own countries.